The ALTA CCMA & MRO Conference is South America’s premier annual maintenance and technical purchasing conference. Over 750 industry professionals gather in one place to focus on four critical industry pillars – innovation, technology, efficiency and regulations – in order to develop effective solutions that maximize aviation’s economic and social footprint within the region. 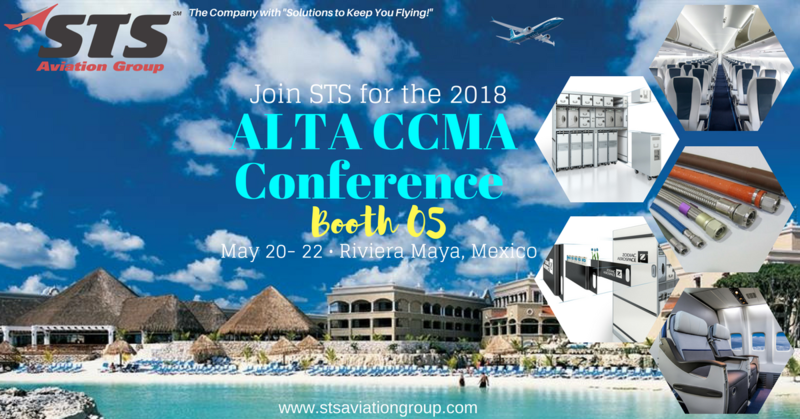 During this conference you can expect informative airline sessions, suppliers’ briefings, conference topics such as Aircraft Connectivity, the Power of “Little Data” and the Evolution of MRO, OEM Consolidation and Impact to Customer Service and so much more! Suppliers’ organizations also have the opportunity to display their products and services during the exhibition, table top sessions and mini meetings with over 100 airline and MRO purchasing representatives. You can also count on the always fun and exciting casual networking events like the golf tournament, 5k run, volleyball tournament, family day lunch, welcome cocktail reception and gala dinner. Members of STS Aviation Group, Tom Covella (Group President, STS Component Solutions), Laura Covella (Accounting Manager, STS Component Solutions), Lucimeia Murta (Account Manager, STS Component Solutions) Gabriel Viso (Account Manager, STS Component Solutions), Luis Garcia (Vice President, STS Air-Pro), and Taylor Salisbury (Marketing Coordinator, STS Component Solutions) will all be available to meet with during the conference to discuss any of your company’s aircraft component, hose & interiors service and support requirements. This event is sure to provide many great opportunities for airlines, MROs and suppliers to connect, create new partnerships and generate business within the South America region and beyond. Be sure to fly by Booth 05 during the exhibition and Table Tops A02, A03, and A04 to meet the STS team. We can’t wait to see you all in Mexico!